This is another of those great carrier air wing sheets. There are three aircraft on it and some pretty colorful markings. First is an RA-5C in light gull grey over white from RVAH-7. For kits you have nothing really new. Only Hasegawa and Airfix made kits of this plane that are well done. 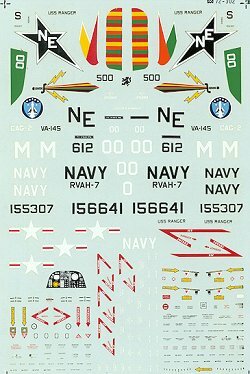 There is a Revell kit out there, but stay away from it as it is pretty bad. A few other equally terrible Korean knock-offs are floating around as well. 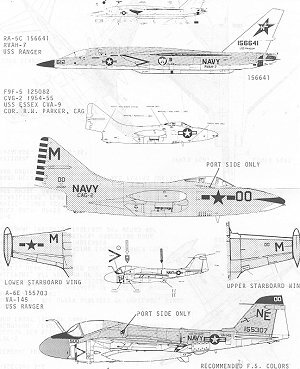 The F9F-5 Panther is in overall gloss dark sea blue and is the CAG-2 bird. It has multi-colors on the nose and fin. The only -5 Panther kit in 1/72 is by Matchbox. The Hasegawa kit is a -2 and will take a bit of work to update. Finally, an A-6E from VA-145. This is a pre TRAM aircraft in gull grey and white. It is also a CAG bird with the colors in the sword on the tail. Fujimi does the best kit with Hasegawa coming a distant second. As with all these old sheets, insignia will have to come from some other source.